The first floating aqua-park in South Africa with various obstacle-course style features with inflatable modules connecting the course together. The first floating aqua-park in South Africa with various obstacle-course style features with inflatable modules connecting the course together. 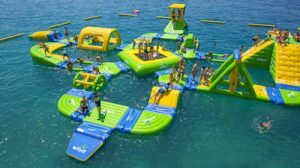 With a series of slides, runways, jumping pillows, bouncers, swings, ramps, jumps, ladders, a trampoline, bridges and more for up to 65 people per hour.